I've been watching some "documentary" shows as of late. One of my favorite series is BBC period "farm" and lifestyle shows in which some anthropologists find a homestead in England which still resembles the type that was lived in in a bygone era and work the land and home in the fashion of a particular time. So far, I've seen a series on Edwardian and medieval farms and have started another on World War II era living. One of the things I've learned is the rose flavoring used to be a pretty big deal. Medieval folks ate flowers and others consumed rose hips. During World War II, when it was hard to come by fruit-based sources of Vitamin C, rose hips kept scurvy at bay. I don't know about the history of eating flowers or flower-flavored items in Japan, but I do know that I was never a fan of "sakura" flavored food and it made an appearance every spring - hand in hand with all of the talk of cherry blossom viewing. 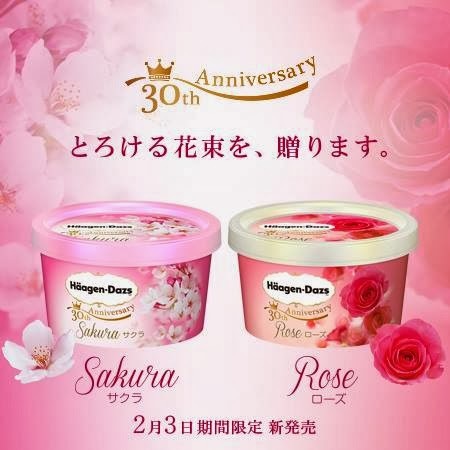 I'm sure that Haagen-Dazs Japan has chosen these flavors based on the time of year and that they will appeal to young women mainly. That delicate and ornate font as well as the pretty flowers make it rather unlikely that the average businessman will be chowing down on one of these at his desk during tea time.